This flowering plant is also referred to as Sambucus, and blooms in the winter. Indigenous to warmer locations in North America and Europe, the shrub is also closely related to the honeysuckle vine. While the delicate white flowers are pretty in the winter, it is the black, bluish, or red berries that are used in herbal supplements. The elderberry bush grows in warmer climates, and is prized by gardeners for its ability to grow quickly and be easily trained into a certain shape. The naturally growing plant can grow in almost any soil type, as long as there is plenty of sun. While it mainly grows in Europe and North America, the plant can also be occasionally found in parts of South America and Australia. Elderberry syrup is a natural remedy for treating the common symptoms associated with the flu, and is even showing to be effective at reducing the amount of time you are sick. While studies are still being conducted, this is only one of the possible health benefits associated with taking this natural supplement. 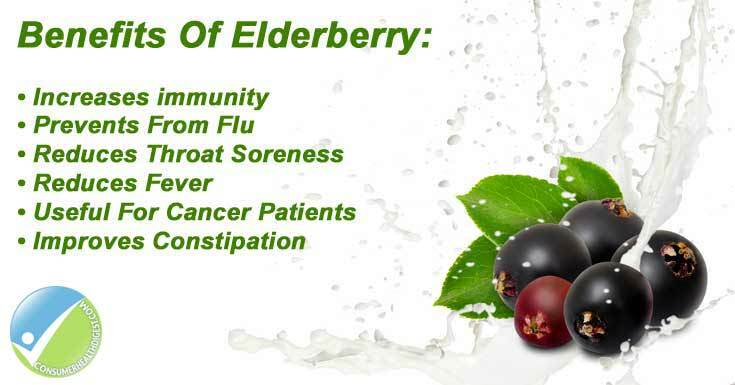 Elderberry can also be taken as a throat lozenge to relief soreness and reduce fever, and initial clinical tests are showing that it normally takes two to three days for the elderberry supplement to begin improving your symptoms. While results are promising for using elderberry to treat flu symptoms, there is still not enough evidence to support the belief that the plant can also treat heart disease and high levels of cholesterol. Other possible uses also include using the berries to treat cancer and relieve pain and cramping associated with constipation. Researchers are also studying the plants effects in treating hay fever, and HIV. Most health care professionals agree that there are very few side effects associated with taking elderberry supplements, but they also warn that ingesting the stems, leaves, or unripe berries can irritate your stomach. The most common side effects were nausea, vomiting, and diarrhea, which normally cleared up after a few hours. If you are afraid that you may have accidentally ingested raw berries, stems, or leaves it is recommended that you speak with your health care provider immediately. While many cultures also use elderberries for flavoring in foods and liquors which makes it difficult for some people to following a regular dosing schedule, many health care experts recommend taking one tablespoon of the syrup four times a day when you are treating the flu for a period no longer than five days. Most adults see the best results after three or four days of regular dosing. Smaller children are give one tablespoon three times a day, and you can take up to four of the elderberry lozenges a day for 48 hours without running the risk of any irritating side effects. Before taking any natural supplement, it is also important to speak to your health care provider. The natural berries are commonly used in liquid syrups used to treat the flu, and in lozenge form. Either method is effective at treating the symptoms commonly associated with influenza, and can be normally taken safely for up to two or three days. While these supplements are considered safe for adults and children, you should always speak to your health care adviser before you add any natural supplement to your daily routine. While research is still ongoing, the natural berries can and will interact with medications that are used to decrease your immune system. Since the primary function of the berries is improving your ability to fight off the germs and bacteria that cause the flu, you do not want to take this natural remedy if you are currently trying to suppress your immune system. If there are any concerns or questions, you should speak with your health care provider. Elderberries are proving to be an effective natural way to treat the symptoms associated with the flu. The fast growing shrub can help to boost your immune system, and relieve fever, aches, and pains associated with influenza. It is safe for adults and children, and the dark colored berries can also be used to flavor certain dishes to keep your immune system strong and healthy all year long.